Rabindranath Thakur, anglicised to Tagore (Bengali: রবীন্দ্রনাথ ঠাকুর) (7 May 1861 – 7 August 1941), son of religious reformer, Maharshi Debendranath, sobriquet Gurudev, was a Bengali polymath who reshaped his region’s literature and music. Author of Gitanjali and its “profoundly sensitive, fresh and beautiful verse”,he became the first non-European to win the Nobel Prize in Literature in 1913. In translation his poetry was viewed as spiritual and mercurial; his seemingly mesmeric personality, flowing hair, and otherworldly dress earned him a prophet-like reputation in the West. His “elegant prose and magical poetry” remain largely unknown outside Bengal. 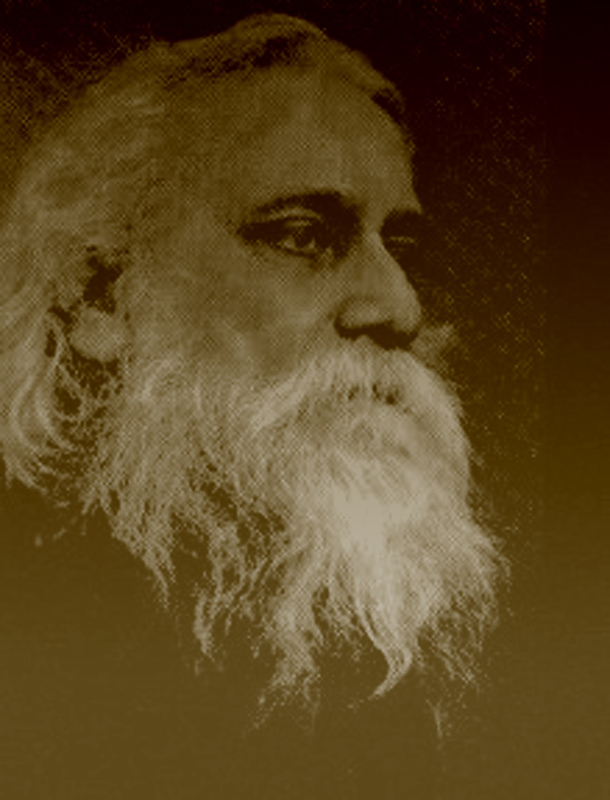 Tagore introduced new prose and verse forms and the use of colloquial language into Bengali literature. He was highly influential in introducing the best of Indian culture to the West and vice versa, and he is generally regarded as the outstanding creative artist of the modern Indian subcontinent. As a humanist, universalist internationalist, and strident anti-nationalist he denounced the Raj and advocated independence from Britain. As one of the greatest exponents of the Bengal Renaissance, he advanced a vast canon that comprised paintings, sketches and doodles, hundreds of texts, and some two thousand songs; his legacy endures also in the institution he founded in 1901 an experimental school in rural surroundings at Śantiniketan (“Abode of Peace”), where he sought to blend the best in the Indian and Western traditions. His school, known as Visva-bharati university since 1939, was granted full university status in May 1951. This entry was posted in Bengaleese, Harbingers, People and tagged rabindranath, rabindranath tagore, rabindranath thakur. Thank you my friend for your kind words. Thank you Mr. Cedar Cove. You are most welcome! The more put it into practice, the more it becomes, but if you are really tight on time, it is possible to outsource this task to have an inexpensive fee. Methodology: This will be the detailed description of your respective proposed program design.